Is the Grotto Full? Looking for something to do on the Peninsula? Stretch your legs and cool off at Bluewater Park. Bluewater Park is a hidden gem on shores of Colpoy's Bay and is where the home of world-famous Wiarton Willie can be found. 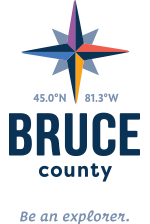 The Park includes a seasonal and transient campground, picnic areas, an outdoor swimming pool, splash pad, tennis courts, fitness trail, historic Train Station and Information Centre, restaurant, beach, playground area, ball diamond, and the Bruce Trail. Bluewater Park is also used for many events including the Rotary Fair, the Agricultural Society Fall Fair, Farmers Market and the Wiarton Willie Festival. People visit from all over the world for the Spirit Rock Conservation Area's local history, legends and remarkable view of Colpoy's Bay. You can explore the "Corran" - the ruins of a 17 room mansion and an impressive view from the top of the Niagara Escarpment. For the brave souls, there is a spiral staircase that leads to the water's edge, and you can access to the Bruce Trail. Bring your camera for some amazing sights! Mmmm…the smell of freshly baked bread, butter tarts and carrot cake! That is what you will smell when you first walk into the market. If you are looking to pick up some groceries such as local lamb, local cheese or local produce – This Farm Market and Bakery has it all. Hope Bay Beach has spectacular views of the Niagara Escarpment and locals gather at the Hope Bay Campground to get their daily ice cream fix! Walk along Water Street to find the most unique shop, The Frog & Nightgown - a great place to shop for souvenirs or cottage décor! Enjoy a hike through rugged forested trails and explore spectacular natural limestone caves. Hike the trails at Greig’s Caves for breathtaking views at 300ft above the sparkling waters of Georgian Bay. Stokes Bay General Store is a popular place for cottagers to grab their ice cream, daily cup of java or play a round of euchre. Enjoy your ice cream along the shoreline! On the Peninsula there is a hidden gem that only uses Canadian grown flours, grains and seeds and is completely organic. Harvest Moon Bakery started up back in 1996 and serves up a variety of mouthwatering pies, breads, pastries and other desserts. In addition, they offer locally grown fruits in season, real cream, and local honey. Enjoy one of these amazing baked goods in the relaxing sculpture gardens on the 25 acre property or on the outdoor tea patio. The Lindsay Tract is the largest of the County Forests consisting of more than 8000 acres. This diverse property has amazing trail potential but also contains sensitive habitat for the Black Bear and Eastern Massasauga Rattle Snake. Development began back in May of 2008 and we will continue to build new trail experiences in the years to come. Whoever said that that you cannot tame Mother Nature must have been a trail builder at the Lindsay Tract. 8,500 acres of heart pounding wilderness, hard rock and good times. Looking for a little adventure in the sky? Look no further than the Little Cove Adventures - Rope Course in Tobermory and Ascent Aerial Park in Sauble Beach. Little Cove Advenures offers both low rope and high rope courses that allow you to manauver from tree to tree and obstacle to obstacle. Te high ropes ourse features challenging elements positioned 20-30 feet above the ground. You will test your balance, strength, and agility in negotiating exciting nets, swings, beams, tires, and rope crossings. The low ropes course is perfect for those explorers who prefer to be closer to the ground. These adventures are located just a few feet off of the ground and are perfect for any age. When visiting Tobermory, Little Cove Adventures is a fun challenge that tests your strength, agility and balance, all while having a great time with friends and family! Ascent Aerial Park is located in downtown Sauble Beach. This aerial park features 3 sections. ‘The Tall’ is the main part of this adventure park, featuring 30 different obstacles on three levels. Test your balance on suspension bridges, cargo nets, lumberjack logs, ship masts nets, and many more! ‘The Wall’ is a rock climbing wall featuring beginner, intermediate and advanced routes! Test your strength and reaching ability on this challenging rock wall! ‘The Fall’ is a 40 foot free fall experience. The scariest part is stepping off the edge- your heart will be pounding! Try the free fall for an exhilarating experience! The brand new Ascent Arial Park is a must try when visiting Sauble Beach this summer.